I am very finicky about eye-shadow palettes so I end up getting confused about which one to get. A dilemma I swear! 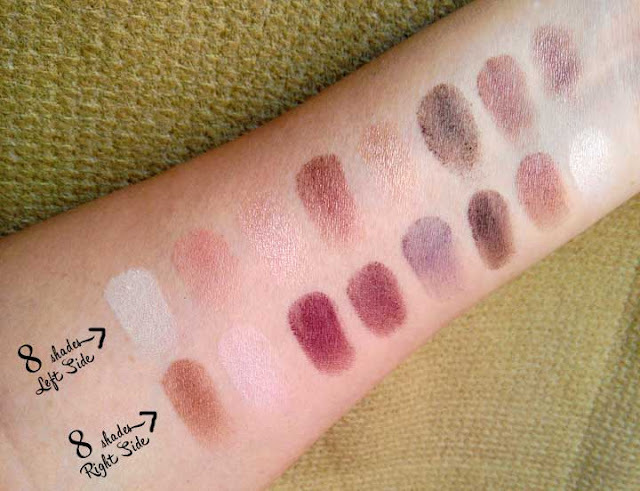 These dilemmas are somewhat fixed when affordable brands like MAKEUP REVOLUTION comes up with great dupes for other more expensive palettes that are giving you an itch. 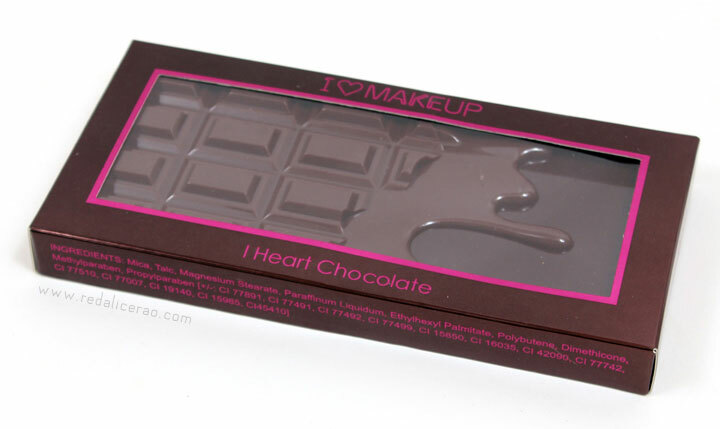 "I Heart Chocolate" is a big winner for being the perfect dupe for Too Faced Chocolate Bar. Thumbs up! The Palette comes in a nice window boxed packaging. 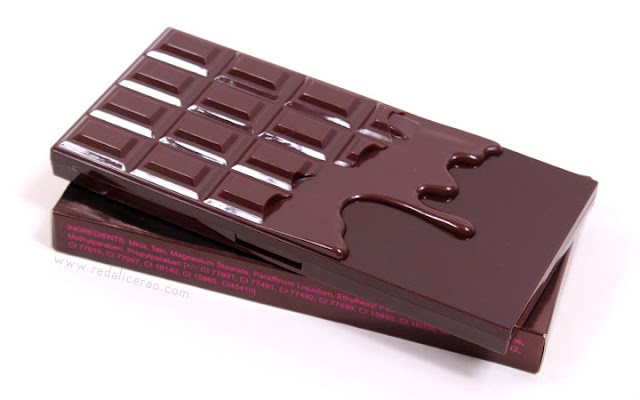 The actual palette looks like a melting chocolate bar, very similar to the chocolate bar look of Too Faced. There are 16 eye shades in total with a double sided sponge applicator. 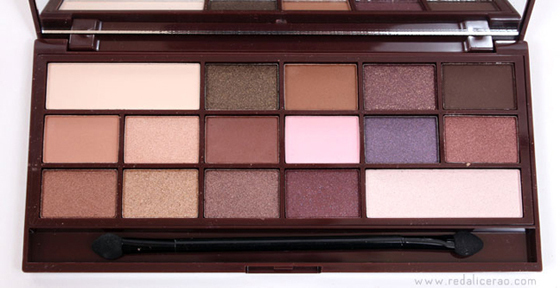 There are mattes and shimmery eye shades as well as neutrals to more darker, jewel toned shades. 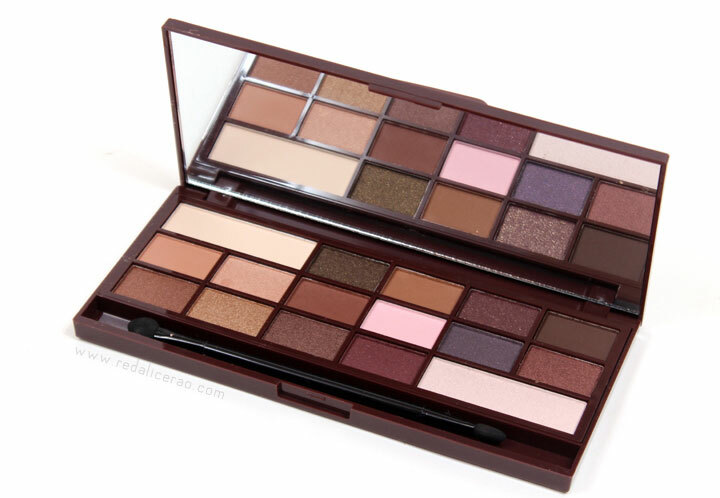 The eye shadows are highly pigmented and I love playing with both the matte and frosty ones. You can use the matte ones as base, highlighters or use as is for subtle definition in a day look. The shades are very similar to Too Faced Chocolate Bar shades and even the sequence is almost the same! The eye shadows vary in consistency. The matte ones are buttery and smooth and the shimmery/frosty ones are dense and rich in pigmentation. 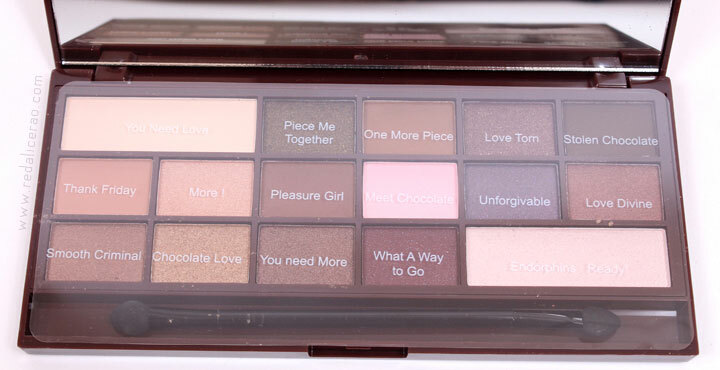 The names of each shade are funtastical. The overall palette is really good and I like the consistency in quality and diversity in shades even though some may look almost the same. 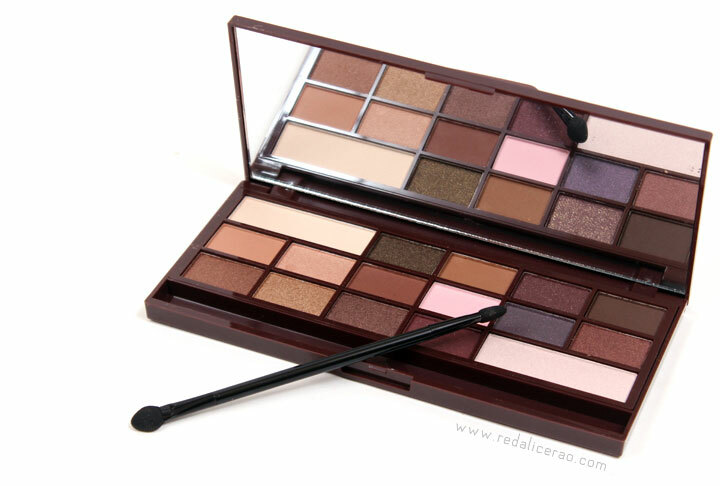 Its fun to do both day and night looks with this palette and it can also serve as a great travel essential. You wont need another neutral, jewel tone palette when you have this in hand. I give this palette a whooping 4/5 as its my new best friend these days! Isn't Makeup Revolution so great? It makes me not want to bother with MAC anymore. I wanted to get my hands on Kiko and Makeup Revolution for the longest time and was planning to this month. However I have blew my makeup budget already and it's only the beginning of February! LOL! I guess next month it is. Oh my gosh, I didn't even know this existed! 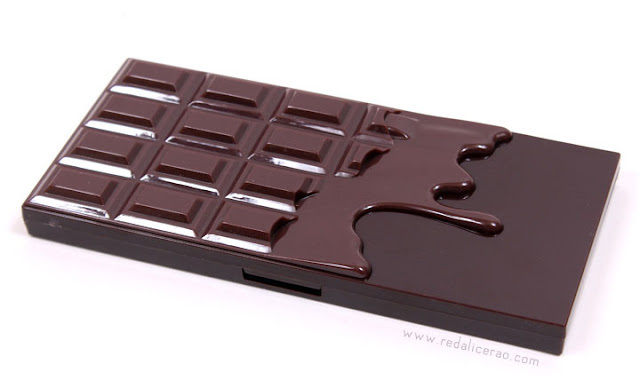 I've been desperate to get the chocolate bar palette for so long, but it's just far too expensive for me - I'm definitely going to be getting this one! Thanks so much for sharing, it was a great post! p.s: There's something wrong with your blog's layout as the text on the extreme sides (initially right-hand) is appearing chopped off and missing. WOW this one looks really good...I want the Lorac Unzipped one so bad! Let's hope we find a dupe for that tooooo and a good one! Ahahah Zubia I go thru this all the time!! Its a Curse for Beauty lovers! to get or not to get! so tempted to get this!! i've been seriously contemplating going for the chocolate bar and this seems such a close dupe!! Its definitely better even for the price value! How do you find the pigmentation of these? Good enough?